Insecticidal and acaricidal responses of Cinnamomum cassia oils made by organic solvent (OS), steam distillation (SD), and supercritical fluid (SF) and their components were examined in two bioassays (contact and fumigant bioassays) against Plodia interpunctella, Sitophilus oryzae, S. zeamais, Tyrophagus putrescentiae, and Sitotroga cerealella adults. Using the contact or fumigant bioassay against T. putrescentiae adults, OS oil exhibited the strongest toxicities (50% lethal dose [LD50], 2.60 μg/cm2 and 1.34 μg/cm3), followed by SF and SD oils. Furthermore, using two bioassays, SD oil against S. oryzae and S. zeamais adults exhibited the strongest toxicities (LD50, 102.25 μg/cm2 and 68.62 μg/cm3, 102.03 μg/cm2 and 57.59 μg/cm3), followed by SF and OS oils. Using the fumigant bioassay against S. cerealella and P. interpunctella adults, OS oil exhibited the strongest toxicities (LD50, 1.17 μg/cm3 and 0.79 μg/cm3) followed by SF and SD oils. 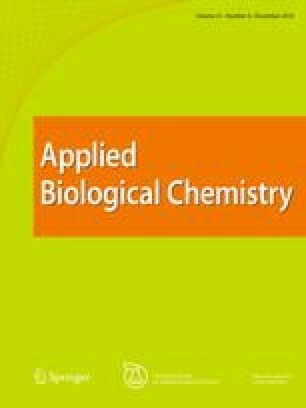 Cinnamaldehyde, cinnamyl acetate, and coumarin against T. putrescentiae adults showed no significant differences in the contact bioassay, but in the fumigant bioassay, cinnamaldehyde exhibited the highest toxicity (LD50, 0.91 μg/cm3) followed by cinnamyl acetate and coumarin. Against S. oryzae, S. zeamais, S. cerealella, and P. interpunctella adults, cinnamaldehyde using two bioassays exhibited the most potent toxicities (LD50, 108.81 μg/cm2 and 77.80 μg/cm3, 104.72 μg/cm2 and 36.48 μg/cm3, 0.57 μg/cm2 and 2.29 μg/cm3), followed by coumarin and cinnamyl acetate in order. The results showed that cinnamaldehyde and the C. cassia oils could be effective values in the management of stored product pests. A correction to this article is available online at https://doi.org/10.1186/s13765-019-0430-8. This research was supported by a grant of the Korea Health Technology R&D Project through the Korea Health Industry Development Institute (KHIDI), funded by the Ministry of Health and Welfare, Republic of Korea (Grant Number: HG18C0055).